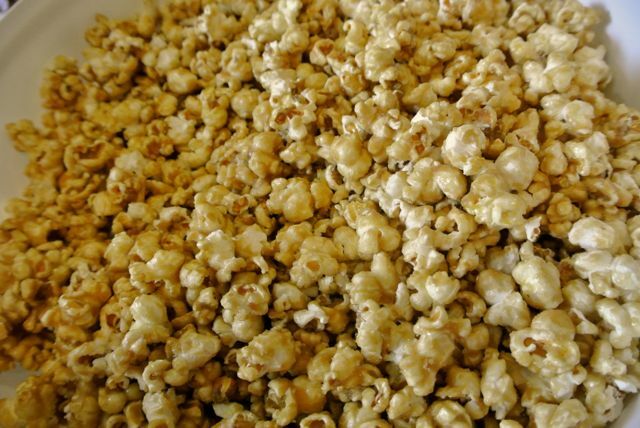 Nothing kicks off the start of fall like a nice batch of carmel corn! Pop popcorn. Place in a very large pot or pan. Melt butter in a heavy pot. Add sugar & corn syrup. Bring to a boil. Cook for 5 minutes. Add salt & flavorings. Stir. Stir in baking soda. It will start to foam, so move quickly. Pour carmel over popcorn. Stir gently so as not to crush the popcorn, but stir well so that the popcorn is evenly coated. Remove from oven. Spread on waxed paper to cool. Store in a large bowl or ziploc bags.